Metropolis, 2008, HD Video, mono/color, sound, 9 min. 30 sec. Stone on Stone, 2009, HD Video, mono/color, sound, 7 min. 44 sec. Sun City, 2013, HD Video, mono/color, sound, 8 min. 39 sec. Rob Carter creates photographs, videos, and installations based primarily on the motif of the city. His stop-motion animations, made by repeatedly cutting and rearranging preexisting photographs, bring a real city and buildings to life. With delightfully humorous movements against a changing landscape, the works form a highly suggestive whole. 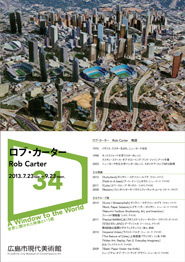 By combining the warmth of his handiwork with a cool philosophical view of human activities, Carter arrives at unique urban narratives. Born in Worcester, U.K. in 1976, Carter currently lives in New York. After studying at the Ruskin School of Drawing and Fine Art, Worcester College, Oxford University, he completed an MFA at Hunter College (part of the City University of New York). He has shown his work at various international exhibitions and film festivals.